Gerald was selected as the 2014 American Library Association Achievement in Library Diversity Research honoree. He earned a master’s degree in library science at The University of North Carolina, a bachelor’s degree from UNC Charlotte. He began work at the UNC Greensboro Library in July 1998. 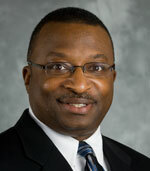 In July 2004, he was awarded tenure by the Board of Trustees and was appointed the first diversity coordinator for the Libraries in May 2008. As a member of the Libraries’ administrative faculty, he led the creation of the Libraries’ Post MLS Diversity Residency Program and its Diversity Committee. As the diversity coordinator, Gerald took on the additional responsibility as a co-principal investigator for three IMLS grants designed to recruit and prepare minority librarians for serving their communities in the 21st century. As a credit to his work, 55 librarians from underrepresented populations are now working. As the School of Information and Library Science representative, he serves on the Alumni Committee on Racial and Ethnic Diversity (ACRED) and helped create the SILS Alumni Committee on Inclusion and Diversity. A Greensboro native, Gerald is married to Dr. P. Sharon Walker ’91 (DDS) and is the proud father of two, Veronica and Aaron. Mr. Holmes’ award citation will be posted after the Light on the Hill Society Scholarship Awards Gala on Nov. 6, 2015.